1. 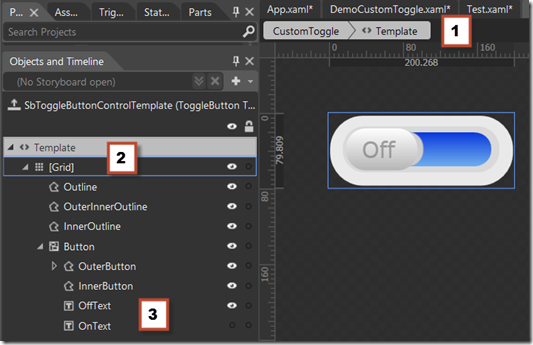 Start in Expression Blend for Visual Studio 2013 by importing a template created in Photoshop to get the basic look of the button. After importing, I will rename and group things to my liking. Name the new control whatever you want. For this demonstration, I will use DemoCustomToggle. 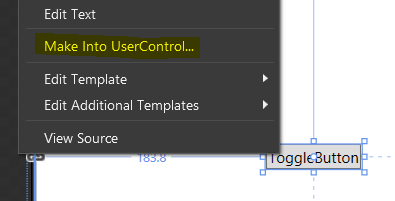 A window will pop up for Create ControlTemplate Resource. Name it whatever you want for my purpose, I am going to use CustomToggleTemplate. Below the name, you will see a dialog for “Define in” and the choices are Application or This Document. Choosing Application will allow you to re-use the resource created throughout the application. For this demo, I am going to place it in this document. At this point, you will see a blank screen with a blank grid and the bread crumb (shown as 1 in the figure below) will say that you are in the template. 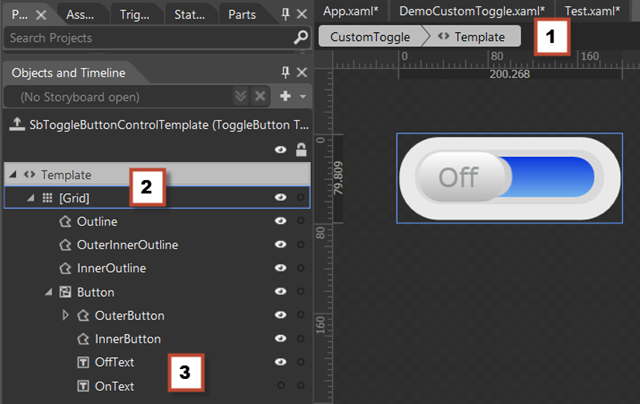 Paste your objects from your import above and manipulate them to get the default view for your toggle. In my case, I added On and Off wording and set On to be collapsed by default. I also added some gradient shading and color to my objects. When you are done, you should see something like what is shown below. 1. BreadCrumb 2. Base Grid for this Template 3. Added content to make the switch look like you want for the default including the other switch position content with that content being collapsed. The states panel contains all the relevant states for the control you are manipulating. In my case, I want the switch to appear to switch to the on position and the text to change when the use changes to the Checked state (shown as IsChecked in the control). To do this, click Checked (2) and change properties on any object you want to in order to get to the desired result. In my case, I moved the button position to the right and set OffText to Collapsed and changed the OnText to Visible. It is very important to pay attention to the red around the Design Window (3) with the words, ___ Recording is on. This indicates any changes you make are being recorded for that state. 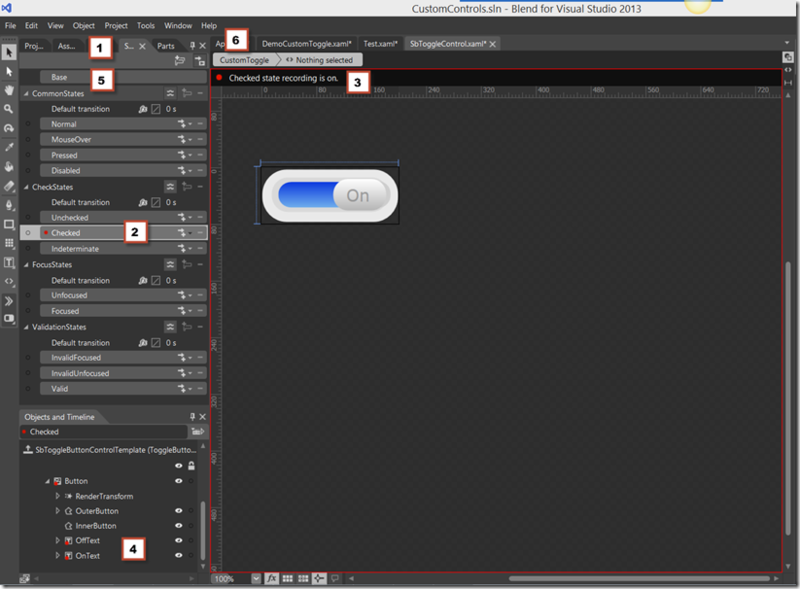 Objects that have been changed will show a red dot next to them in the Objects and Timeline window (4). You can click on each state to see what your control will look like in that state. When you are done making changed, switch back to base by clicking it (5) . Then to get out of working on the template, click the base object in the breadcrumb (6). At this point, your control should work as expected. 3. At this point, the control works with a mouse but does not respond to touch. To add touch support, use the UIElement Events. I used TouchMove to figure out the eventual value based on the direction of the touch gesture and TouchLeave to record the new value. The IsChecked Property can be set in the TouchMove event but it will be triggered multiple times which is why I chose to use a variable and set the IsChecked on the TouchLeave Event. 4. At this point, your control will now work with a mouse and touch. Now we need to expose the properties we want to use with out control. We will create dependency properties. For this example, we will just expose an IsSwitchedOn property and bind it to the IsChecked property. Now your control is ready to be used.